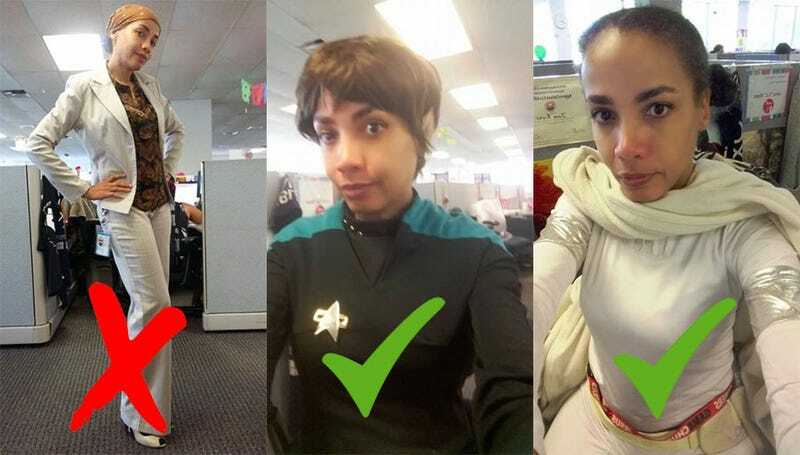 Cosplayer June Rivas was told by her boss that her work attire was “unprofessional”. Good thing she had a fix for that. Yahoo reports that Rivas’ employer told her that “wearing her hair in a ponytail or donning a head scarf was unprofessional” (pictured, top), despite the unnamed company’s dress code simply stating that employee’s clothing needed to be “clean and pressed”. When Rivas filed a harassment complaint over this, the boss responded by detailing the dress code to include the banning of “straps, hats, sandals, cleavage, back out, lace, and even “cultural head wraps”. The Yahoo story says she has since reported her boss (who is female) to the US Equal Employment Opportunity Commission, though in the meantime has found a workaround: cosplaying to work. Finding outfits that match the dress code, she’s taken photos of herself at her desk wearing everything from Star Trek to Padme to Black Widow. Which might turn heads, but they most definitely do not include sandals or lace.